It's going to be a lot easier for fans of Dunkin' Donuts coffee to get their java fix. Keurig Green Mountain (GMCR) last week expanded its partnership with Dunkin' Donuts parent Dunkin' Brands (DNKN) and its coffee distributor J.M. Smucker (SJM). 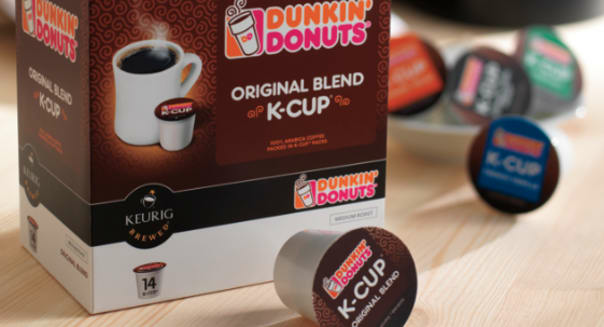 Dunkin' Donuts makes its signature coffee available as K-Cup portion packs for Keurig brewers that it sells through thousands of Dunkin' Donuts doughnut shops today. The expanded deal will now find Dunkin' K-Cups sold through more retail outlets, including Keurig's own website. Going from thousands of places to buy Dunkin' K-Cups to tens of thousands is a win-win-win deal. Smucker will naturally ring up more sales as the distributor, but there's even more to gain by Keurig and Dunkin' Brands. Keurig is the undisputed champ of single-serve brewing platforms. There's no one that's even close to the company that made one-cup servings of premium coffee, accessible anywhere, that one can plug in its namesake brewer. Keurig Green Mountain has been one of the market's biggest winners over the past few years. The stock has been a 30-bagger over the past eight years. Unfortunately, it's feeling pretty mortal these days. Last month's quarterly report was problematic. Net sales were flat with the prior year, held back by a 12 percent decline in brewer sales volume. It's easy to spot the problem. Keurig got greedy last fall, rolling out the Keurig 2.0 platform that came with a digital rights management feature that refuses to brew any K-Cup that doesn't have a Keurig-authorized lid. It's easy enough to circumvent. Those with older K-Cups and third-party portion packs can simply slap a newer label on the lid to trick the scanner. However, the whole episode left a bad taste in consumers' mouths. Customer reviews for the new brewers haven't been kind. Making Dunkin' Donuts brews more widely available won't repair Keurig's reputation, but it does solidify the lineup. Dunkin' Brands can also use the boost. Comparable-restaurant sales at Dunkin' Donuts rose just 1.4 percent in its latest quarter, and the uptick was even more modest overseas. Dunkin' needs to keep sales growing at the individual store level if it wants to continue to build out its franchisee-fueled concept, and expanding the exposure of its popular coffee can help. One would normally think that making Dunkin' coffee easier to brew at home or the office break room would hurt sales of franchisees. Why go line up at a Dunkin' Donuts if the same beans can be brewed anywhere else? Well, in a savvy move, Dunkin' is cutting its franchisees in on the action. Dunkin' Brands will share the proceeds with its franchisees. The unprecedented deal could yield between $2,500 and $3,000 a year for franchised locations. For once we find the franchisees on the royalty-collecting end of the arrangement. It's a development that could actually encourage more franchisees to hop on, giving them a new revenue channel to consider. So, yes, this is a deal that should benefit all three companies, but Keurig Green Mountain is the one that probably needs this the most. Motley Fool contributor Rick Munarriz owns shares of Keurig Green Mountain. The Motley Fool recommends Keurig Green Mountain. Try any of our Foolish newsletter services free for 30 days. To read about our favorite high-yielding dividend stocks for any investor, check outour free report.